The Company has entered into an agreement with Red Lion for a non-arms’ length Credit Facility consisting of an initial $500,000 line of credit to fund development expenditures at Tuvatu in Fiji and for general working capital. The Credit Facility will be available for drawdown in multiple tranches with interest payable at 9% per annum. The Credit Facility will be secured by a General Security Agreement granting an encumbrance over all assets of the Company and subordinate to subsequent acceptable credit facilities secured by the Company. Lion One will retain the right to prepay the Credit Facility at any time without penalty. The Credit Facility provides liquidity and financial flexibility to the Company as it evaluates financing alternatives. Red Lion is a merchant banking company owned by Mr. Berukoff, with diversified investments in real estate development, agriculture, mining, and private equity. In 2007, Red Lion acquired the Fijian asset base of Emperor Gold Mines of Australia, including the Tuvatu Gold Project, the operational Vatukoula Gold Mine, a greenfield exploration portfolio, and the Vatia Wharf diesel fuel storage and distribution facility. Emperor had invested an estimated $30 million advancing Tuvatu, and in 1999 completed approximately 1,600 meters of underground development to enable the collection of bulk samples for metallurgical, laboratory testwork, detailed mapping and sampling. In 2000 pre-feasibility and feasibility studies were completed, with positive economic results – these reports are now treated as being historic in nature, as they were prepared prior to the introduction of NI 43-101. Vatukoula, which has produced over 7 million ounces of gold since the 1930’s, was sold in 2008, while Red Lion funded and advanced Tuvatu privately for 3 years before the project was taken public by Lion One in 2011. The Company has cleared the Tuvatu site for the proposed processing plant facilities and infrastructure, which includes an administration block, warehouse, stores, and assay laboratory. The proposed processing plant consists of a conventional two-stage crushing and screening circuit, with a two-stage grinding circuit and gravity separator feeding flotation cells, with a regrind circuit for concentrates. The processing facility has been designed to potentially treat 219,000 tonnes per year over seven years at a projected throughput of 600 tonnes per day, at an average head grade of 11.3 g/t Au, to produce gold doré at estimated cash costs of US$567 per ounce. Anticipated capital costs are US$48.6 million with a 15-month pre-production schedule. The proposed development work is based on the results of the technical report and NI 43-101 Preliminary Economic Assessment dated July 14, 2015; a summary of this report is in Table 1 below. Metallurgical test work, process plant design, and tailings storage facility optimization are continuing. The metallurgical and tailings test work is based on the process flowsheet utilized in the Preliminary Economic Assessment and is designed to evaluate potential improvements in metallurgical recoveries from the average 86.3% estimated in the current study and to determine if costs can be potentially reduced on the tailings storage facility (“TSF”). The metallurgical testwork and tailings testwork are expected to be complete in Q1 2016. The Board has instructed management to move forward with detailed engineering for the Tuvatu processing plant and TSF adjustments pending the completion of current testwork. The Vatia Wharf terminal is a diesel fuel import and storage facility located in western Fiji that was part of Emperor Gold Mines’ Fijian asset portfolio when acquired by Red Lion in 2007. It is now held in a private company controlled by Lion One CEO Walter Berukoff. The terminal is located 100 km by road from Tuvatu, and comprises a 200 meter jetty with a deep water wharf and docking station, a fuel storage facility and truck filling station. The fuel terminal has been rehabilitated and upgraded to compliance with the International Ships and Port Facility Security Code (ISPS), the guidelines of Fiji’s Maritime Safety Authority, and is classified as a safe port with Lloyd’s Maritime Directory List and Shipping Gazette. The Company has commenced discussions to secure stable long term fuel supplies from this facility, which is expected to become operational in 2016. All of the resolutions that were presented at the Company’s AGM held on December 10 were approved by the shareholders, including the nomination of the directors and auditors, and approval of the stock option plan. Shareholders elected Walter H. Berukoff, Richard Meli, Stephen Mann, and Kevin Puil to the Board of Directors with an average approval rating of 97.81%. A total of 93 Shareholders representing approximately 32% or 19,276,294 of the Company’s 60,175,608 outstanding shares were represented at the meeting to vote on the resolutions presented. The TSX Venture Exchange has accepted for filing the annual renewal of the Company’s Stock Option Plan (the “Plan”) approved by shareholders at the December 10 AGM. The Company has implemented an amended rolling stock option plan whereby a maximum of 10% of the issued shares will be reserved for issuance under the Plan. A total of 6,017,560 shares are eligible to be issued under the Plan. During the subsequent Board meeting Mr. Stephen Mann was re-elected Managing Director of the Company, Mrs. Sam Shorter as Chief Financial Officer, Hamish Greig as Vice President and Corporate Secretary, Stephanie Martel as VP Administration, and Mr. Walter H. Berukoff as Chief Executive Office and Chairman of the Board. Richard Meli and Kevin Puil were reappointed to the audit committee. 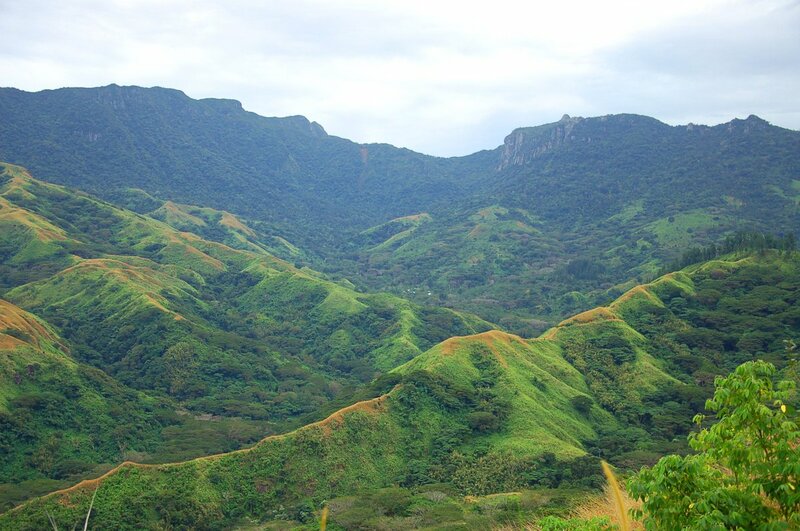 Tuvatu is a high grade, low sulphidation epithermal vein hosted gold deposit located on Fiji’s main island, Viti Levu, 17 km from the international airport in Nadi. The tenement package includes 12,000 hectares held under Special Prospecting Licenses (SPL’s 1283, 1296, and 1465) and 384.5 hectares under a Special Mining Lease (SML 62). Discovered in 1987, Tuvatu had significant development in the late 1990’s by the Emperor Gold Mining Company of Australia which completed over 87,000 meters of drilling, 1,600 meters of underground development, trial mining, and a feasibility study in the year 2000. Lion One Metals acquired the project through a merger between X-Tal Minerals Corp. and American Eagle Resources, Inc. in 2011. In 2015 the Company was granted a Special Mining Lease (“SML 62”) by the Government of Fiji through the Mineral Resources Department (“MRD”) completing the permitting process for development, mining, and processing operations at Tuvatu. In 2014 the Company secured environmental approvals through the Fiji Government’s Department of Environment, for its Environmental Impact Assessment (“EIA”) and Environmental Management Plans (“EMP’s”). Also in 2014, the Company finalized a 21-year Surface Lease Agreement following extensive consultations and meetings with heads of local communities and landowners. The Surface Lease agreement and environmental approvals follow over two hundred consultations that took place over a period of four years with various groups including the MRD, Rural Local Authority, Town and Country Planning, Lands Department, Forestry Department, and i-Taukei Land Trust, in addition to numerous communities and stakeholders in the district. Tuvatu contains a mineral resource estimate of 1,101,000 tonnes of indicated resources at 8.46 grams per tonne (g/t) containing 299,500 ounces gold, and 1,506,000 tonnes of inferred resources at 9.67 g/t containing 468,000 ounces gold, at a 3.0 g/t cutoff. For further details of the project please refer to the Company’s technical report and Preliminary Economic Assessment dated July 14, 2015, available for download on the Company’s website or the SEDAR website at www.sedar.com. Rob McLeod, P.Geo, a consultant to the Company, is the Company’s designated qualified person for this news release within the meaning of NI 43-101 and has reviewed and confirmed that the information contained in the release is consistent with that provided by the independent qualified persons responsible for the underlying PEA. 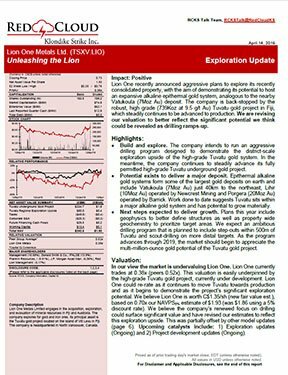 Lion One Metals Limited is a Canadian mining exploration and development company focused on the development of its 100% owned and fully permitted high grade Tuvatu Gold Project in Fiji. The Company is led by Walter Berukoff, an entrepreneur with a successful track in various industries including real estate, finance, and mine development. As the founder and original CEO of companies such as Miramar Mining, Northern Orion Resources, and La Mancha Resources, Mr. Berukoff has developed and operated over twenty mines in seven countries, and is credited for creating over $3 billion in shareholder value through their subsequent acquisitions. For more information on the Company and its projects please visit the Company website at www.liononemetals.com. Forward Looking Statements: Some statements in this news release contain forward-looking information or forward-looking statements for the purposes of applicable securities laws. These statements include, among others, statements with respect to proposed exploration and development activities and their timing, resource estimates and potential mineralization, the PEA, including estimates of capital and sustaining costs, anticipated internal rates of return, mine production, estimated recoveries, mine life, estimated payback period and net present values, opportunities to enhance the value of the Tuvatu Gold Project and other plans and objectives of Lion One. These statements address future events and conditions and, as such, involve known and unknown risks, uncertainties and other factors, which may cause the actual results, performance or achievements to be materially different from any future results, performance or achievements expressed or implied by the statements. Such factors include, among others and in addition to those described elsewhere in this release, delays in obtaining or inability to obtain required government or other regulatory approvals, permits or financing, the risk of unexpected variations in mineral resources, grade or recovery rates, of failure of plant, equipment or processes to operate as anticipated, of accidents, labor disputes, and unanticipated delays in completing other development activities, the risk that estimated costs will be higher than anticipated and the risk that the proposed mine plan and recoveries will not be achieved, equipment breakdowns and bad weather, the timing and success of future exploration and development activities, exploration and development risks, mineral resources are not as estimated, title matters, third party consents, operating hazards, metal prices, political and economic factors, competitive factors and general economic conditions. In making the forward-looking statements, the Company has applied several material assumptions including, but not limited to, the assumptions that: required approvals, permits and financing will be obtained; the proposed exploration and development will proceed as planned; with respect to mineral resource estimates, the key assumptions and parameters on which such estimates are based; that the proposed mine plan and recoveries will be achieved, that capital costs and sustaining costs will be as estimated, and that no unforeseen accident, fire, ground instability, flooding, labor disruption, equipment failure, metallurgical, environmental or other events that could delay or increase the cost of development will occur, and market fundamentals will result in sustained metals and minerals prices. The Company expressly disclaims any intention or obligation to update or revise any forward-looking statements whether as a result of new information, future events or otherwise except as otherwise required by applicable securities legislation. The Company has concluded it has a reasonable basis for providing the forward‐looking statements included in this announcement. The detailed reasons for that conclusion are outlined throughout this announcement and in particular under the headings “Preliminary Economic Assessment Parameters – Cautionary Statement” The Company confirms that it is not aware of any new information or data that materially affects the information included in the announcements and that all material assumptions and technical parameters underpinning the resource estimates continue to apply and have not materially changed. This announcement was made in Canada for the TSX.V and in Australia for the ASX. Public filings for Lion One Metals Limited are available at SEDAR www.sedar.com(Canada) and www.asx.com.au (Australia). Neither the TSX Venture Exchange nor its Regulation Service Provider accepts responsibility for the adequacy or accuracy of this release.